A Statutory “administrative court” is for commerce, in practice (de facto). It is a place of corporate banking offering “a dispute resolution service for consenting parties”, where living men and women (unwittingly) consent to be party (joined) to an artificial legal “person”, obligated to settle the accounts of commercial (adhesion) contracts. The Judge does not sit “judicially”, but acts as a corporate “administrative officer”. “Administrative courts” are not sanctioned by Parliament, and are not part of the de jure laws and usages of the realm. All “administrative courts” are UNLAWFUL because they do not have a jury present. is the only venue of “Justice” for a living Man or Woman. Administrative courts operate on assumptions and presumptions. The Crown makes the presumption that you are “acting” in “joinder” to the “artificial person” NAME. When you answer to the NAME, you are joining the action involving the NAME, such that the man/woman and the NAME are joined in a single case. But that case is in legal fiction commerce, in the Admiralty Maritime jurisdiction, which is the International Law of the Sea. Having joined the case by your “agreement by conduct”, there is the presumption of your “implied agency” for the vessel NAME (i.e. JOHN DOE) on the sea of commerce, including your willingness to settle its account liabilities in court as the Trustee of the vessel's Estate Trust (i.e. MR JOHN DOE TRUST). Whereas, as an aware man/woman, you are the rightful controlling Agent, Beneficiary, Executor/Executrix for MR JOHN DOE TRUST. You are not the liable Trustee. 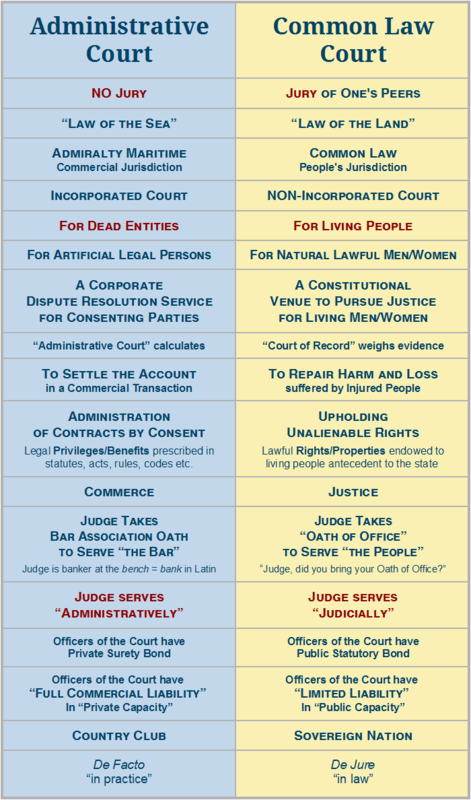 All legal jurisdiction arises from the consent of a man/woman to be party to an “artificial person” NAME. Without consent, there can only be the “presumption” of consent. So when you “rebut the presumption” they have no jurisdiction and cannot proceed. Any further action is fraudulent. To Rebut The Presumption it is only necessary to correct the mistake in the NAME. Presumption n. a rule of law which permits a court to assume a fact is true until such time as there is a preponderance (greater weight) of evidence which disproves or outweighs (rebuts) the presumption. Each presumption is based upon a particular set of apparent facts paired with established laws, logic, reasoning or individual rights. A presumption is rebuttable in that it can be refuted by factual evidence. One can present facts to persuade the judge that the presumption is not true.